“The first time we saw this house we knew it had to be ours,” said Trish Tanner. “We signed a contract that day.” Louis and Trish Tanner could see the potential that the contemporary home offered. 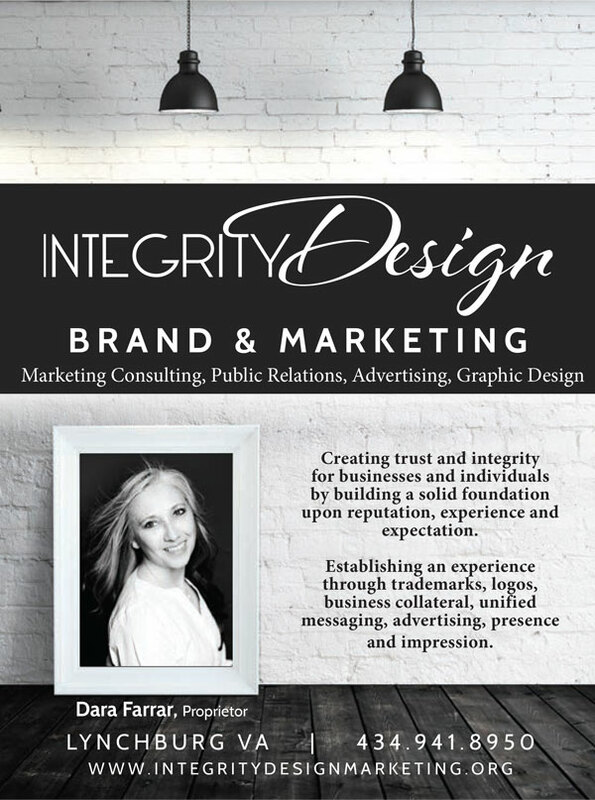 Its location on Ivy Creek was appealing and it was within a short commute to their offices. Trish is a third-generation Lynchburger and Louis grew up on a Rustburg farm in Campbell County. They pursued careers in science, Louis as a Hematologist and Trish as a Chemist, and they both worked for Centra Health in Lynchburg. Now the couple is enjoying retirement. 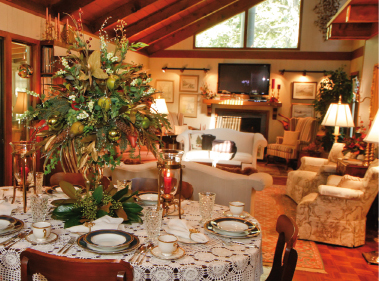 A description of Trish and Louis Tanner’s home is as much about them as it is about their cherished collections. The couple has lived here for almost thirty years and over that time the home has been enriched with charming possessions. Some are family pieces and others Trish has discovered on her worldwide travels. When traveling, if she sees something she just can’t live without, she ships it home. The front door has an interesting history. 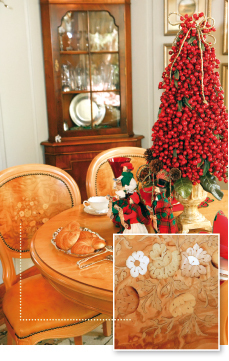 It is carved oak, with massive proportions and is beautifully decorated for the holidays. Originally the door hung in the entrance of a Spanish monastery. The first owners had purchased it and moved it from house to house but never used it. It does not match the dimensions of American doors. When they built this house the owners designed the entrance to accommodate the door. Hence, when their home sold to the Tanners, the door was included. A lovely antique floor clock welcomes guests in the entrance hall. Trish discovered this piece on a trip to Germany and as soon as she saw it, she knew it was exactly right for this spot. With its original curved glass, face and chimes, this solid oak clock was a bonanza. She held her breath when it was shipped across the Atlantic, but it arrived in pristine condition. The house features a sweeping floor plan with cathedral ceilings. An open cedar staircase leads to a guest loft with a sitting room overlooking the great room below. Louis discovered a bench at his home place in Campbell County that had multiple layers of upholstery on its frame. Once they were all removed, Louis was delighted to discover carvings on its back. Today, it has been reconditioned and has a place of honor in the loft sitting room. Louis and Trish designed the mantel over the great room’s fireplace from a chunk of Western cedar. They started with a rough log and, according to Trish, together they dragged it across the planer many, many times to make it smooth. Near the mantel are a number of small landscape paintings, all painted by friend and artist Cynthia Gordon. On the hearth is a shiny copper canner. At one point the canner was dented and dull. Louis rescued the piece from his family farm and after a thorough cleaning, it has taken on the gleam of yesteryear. The couple found a large piece of driftwood along the Outer Banks. Once it was oiled and polished, they mounted it on a nearby wall where it is now an artistic addition. The great room stretches into sitting and eating areas. A triptych hanging on a wall in the loft is visible from the great room. Trish refers to this piece as her “extravagance.” It was painted by Russian-born artist Alexander Anufriev and depicts groups of angels and the expulsion of Beelzebub, as described in the book of Revelation. Anufriev was a member of the Odessa group in Russia and immigrated to the United States, now making his home in the Washington, D.C. area. Though not as prominent as the work of Anufriev, other pieces are significant for the Tanners. A hanging sculpture entitled “First Symphony” is a modern figure fabricated of copper that they discovered outside of Roanoke. Among Trish’s favorites is a bright and airy oil entitled “Lora Lisa” by Anita Noë. It captures a young woman in a long dress strolling through the woodlands carrying a broad- brimmed hat. Some displayed works of art were gifts from friends. One was a special gift presented to Trish’s mother. Growing up, Trish remembers her mother helping one of the residents of the Elks Home, Tom Sidonia, learn to read and write. Prior to his retirement, he was the artist for Barnum & Bailey Circus. To thank her for her help, he painted a scene of the surrounding mountains and presented it to her. Trish fondly recalls her mother telling her “an Elk was coming to the house” and Trish waited expectantly for a four-legged variety to arrive! Another special painting is an oil that Trish presented to Louis as a gift. “Christmas was coming and I did not have a present for my husband,” explained Trish. 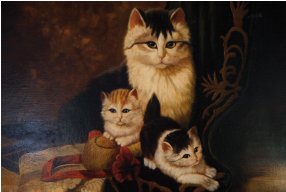 “I went into Lynchburg Florist and Antiques and I saw a painting of a series of cats. I thought, this is a perfect present for my Louis.” It now holds a place of honor in their great room. “Everyone who knows us understands that if for any reason we should split up, this painting is his!” Trish laughingly added. The galley kitchen is adjacent to the great room and its location provides easy access for meals in all of the public rooms of the house. According to Trish, very little has changed here. Appliances have been updated, but the 1970s cabinetry and counters have remained unchanged and their sleek and clean lines are still in style. A rooster ‘painted’ by Trish, using a variety of colored legumes, hangs on a wall. A cartouche depicting all of the herbs noted in the Bible, a gift from Trish’s mother, holds a very special place in Trish’s heart. A stained-glass door with grapes and cattails separates the kitchen from the formal dining room. Trish designed it and commissioned a local artist to create the finished product. Adjacent to the great room and stretching across the entire length of the house is what the Tanners call their cat room and sun porch. This room was previously an open porch. Once enclosed, it created the perfect place for everything feline and is equally enticing to people. “We have three indoor cats and one new indoor/outdoor cat,” said Trish. “They are all rescues.” She went on to explain that a sign in their yard indicates their fond support of the Lynchburg Humane Society. Two days after the sign went up a new stray appeared. Apparently their cats can read! The cat room is lined with windows and protected from the sun with striped awnings. Their kitties enjoy a lovely view of the backyard which, much to their delight, is a haven for wildlife. Among the necessary litter boxes and kitty beds on the porch are assorted tables and easy chairs, many of which are antiques. “This is my very favorite table in the whole world,” said Trish, pointing to a small circular table. “My father made this just for me when I was a little girl. It is very special.” A watercolor featuring a cat is another of Trish’s finds. Purchased from a street vendor in England, the piece depicts a very sophisticated cat in tones of sepia and black. According to Trish, the site of their formal dining room was at one time the location of an indoor lap pool. A narrow room, heated with solar panels, it was laden with problems so the couple decided to do away with the pool and create a very formal dining area for large dinner parties. “I knew exactly what I wanted,” said Trish. “When I went to Italy way back in the 1970s I always remembered the vaulted ceilings. I just did not know how to make it happen.” The Tanners called in Allen Howerton with Custom Crafters to oversee the project. 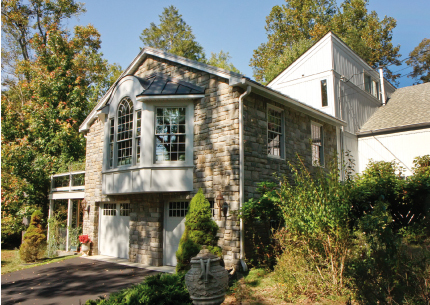 “Allen had one craftsman who did know how to make it happen.” The final product is an expansive room with vaulted ceilings and a stunning Palladian window. The walls are the color of peach which faux artist Sonny Harlow applied using rags and sponges. Moyanne Harding designed the window treatments and the hand-embroidered silk window seat covers. The banquet-size tabletop is a solid piece of wood and accommodates ten. Here, the table is set for Christmas Evening dinner. Ray Pulliam and David Heal of Lynchburg Leo Wood, Florist made the floral designs and table arrangements. The formal table has sequined and beaded copper-colored placemats, china by Spode, Gorham silver and Waterford crystal. 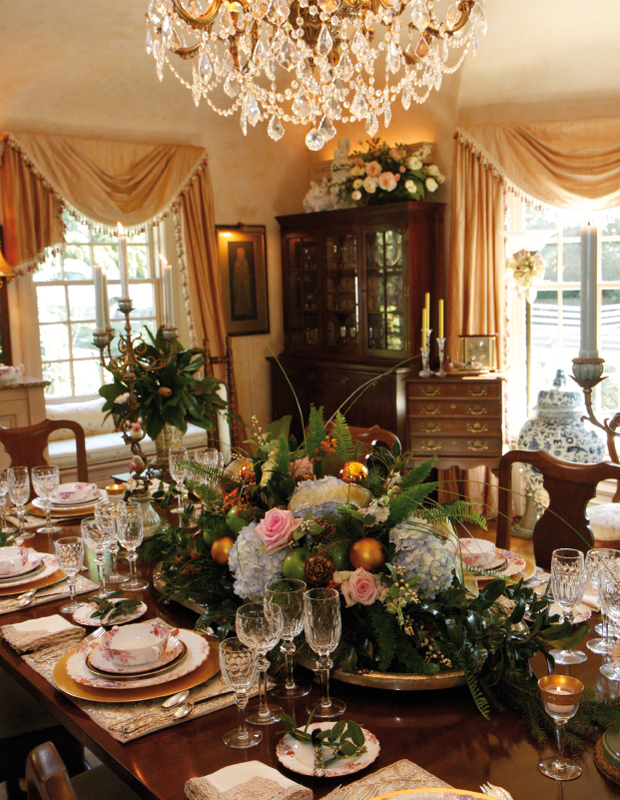 A fresh arrangement containing hydrangeas, roses, coral-colored waxflowers, magnolia, holly and spruce stretches four feet down the center of the table. A built-in buffet holds china and serving pieces. Along the granite top Trish has displayed her collection of Noah’s Ark figurines. Brass rubbings created by friends hang on either side. A back hallway leads to Trish’s office. A framed series of pictures features her favorite spots in Rome: The Piazza Novona, The Spanish Steps and Saint Peter’s. Nestled among her books, Trish displays ceramic renditions of the Seven Dwarfs, which she painted. Another cabinet displays her collection of childhood dolls that she lovingly restored, plus a series of Rosina Wachtmeister cats manufactured by the Goeble Factory. When Trish first found these cats, she wanted one…then another…and more. Now she has the entire collection. Hanging in the master bedroom is an oil painting of an egret rookery. According to Trish, she literally rescued it from the incinerator. It was warped and the studio had discarded it. Trish bought the piece for the price of the canvas, brought it home and remounted it. Now the oil hangs opposite the king-size bed. “I lie in bed each morning and soar with the egrets!” said Trish. On our tour, Trish and Louis enthusiastically pointed out their special finds and treasured pieces. They have acquired their collection for their intrinsic values. They love what they collect and use and display it because of this. Whatever Trish and Louis discover and reclaim, Trish believes these things were meant to be. Things call to her and she invites them into her home. With every trip, Louis wonders what Trish will bring home this time. “I am always surprised when she gets back.” It certainly makes life interesting and charming in the Tanner residence.